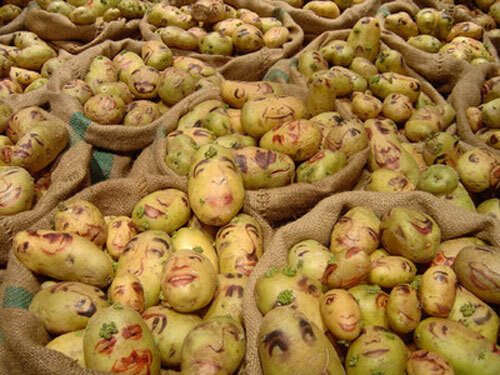 earthapplejane: Potato Portraits - Incredible Art! Potato Portraits - Incredible Art! with you all today. Prepare to be amazed! Do you see anyone you know?! Incredible aren't they? And they are from Ginou Choueiri who describes herself as an interdisciplinary artist currently based in Beirut, Lebanon. Presumably they'll quickly become withered and wrinkled - just like real people. Amazing is the word. I know exactly what you mean John! If you are interested to take another look I have added a link to her website where you can be even further amazed. Comical potatoes . . . Now I can say, "I've seen everything" LOL. Oh my goodness! How absolutely unique! Hi again Kirsty. I have had a look at some shorts for the Gleaners movie and it looks really interesting. And the mutatoes is fascinating too! Very true where they intro it by stating that we have got used to vegetables being uniform and exactly the same as the next one, and the next one and so on. posting about potatoes tonight, pleased you liked the links. I just love that movie.